If youre are interested in teaching your kids about the Japanese culture, there are many great sushi recipes for kids that are fun to make at home. Many parents usually dont know at what age is best to feed their kids sushi. Japanese people probably have fed their youngsters sushi as they got old enough to being able and eat rice. There are certain risk you have to avoid before feeding your kids raw fish as it may cause them to choke when taking a bite. The age of 8 is usually the best recommended. Enough said, below I will show everyone a good and simple way to make fish free sushi rolls as a healthy meal for your kids. First you will need 3 cups of sushi rice or you could also use short grain rice. Don't use instant or converted rice. For your second ingredient you will need 3 cups of water. Third ingredient needed are 3 tablespoons of sushi vinegar. Fourth ingredient needed is 1 package of nori sheets roasted or cooked. (make sure they aren't raw). Next ingredient is 1 bunch of asparagus. Last ingredient you will need is 1 bag of small carrots or wasabi paste. Before you let your kids help you prepare the sushi rolls, make sure the children are old enough to handle sharp knifes. As you might notice, this recipe contains asparagus and other types of vegetables. You might need to cut more pieces that are a little harder to cut. As of asparagus dont really need slicing that much. 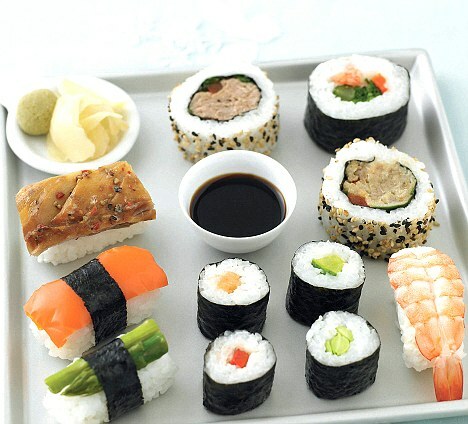 This recipe is great to teach your kids how to cut vegetables and make sushi rolls with rice. The first thing your kids need to do is have 2 cups of rice sushi measured into a large bowl. Before you continue, you need to make sure the rice is rinse. Then stir it in cold water, with carefulness pour off the cloudy, fill with water and repeat about 3 times on the rest. Grab a colander and drain for 30 minutes. While your rice is draining and being cooked, you could also make the kids prepare small piles for sushi assembly. Have a bowl of water on the side to wet your hands while you spread the rice. If you decide to use wasabi, make sure to put spoonfuls in a bowl for an easier use. It is important to let your kids know how spicy wasabi sauce is. You can cut the sheet of nori in half sizes and store them in a large Ziploc bag for it to get moist. This fun and exciting way to make sushi with your kids will make you create unforgettable moments. This recipe is a great way to teach kids of all ages to learn and make sushi. 0 Response to "Sushi For Kids"